MYSTERY OF THE MISSING DEBRIS: On June 3rd, amateur astronomers were startled by a bright flash of light on Jupiter. It appeared to be an impact event--a comet or asteroid hitting the planet's cloudtops. Curiously, though, the strike left no obvious debris. Was it really an impact--or something else? Today's story from Science@NASA discusses the possibilities. "The comet was only 10 degrees above the horizon," says O'Connor. 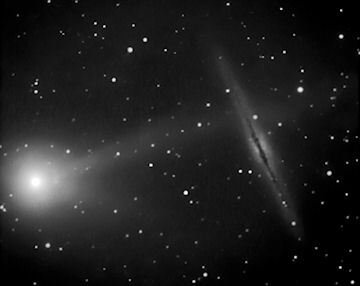 "Nevertheless, we got a good picture using a 12-inch telescope and an SBIG ST9-E camera." And, no, the denizens of that distant galaxy did not flinch, flee, duck or take notice in any way. NGC 891 is 30 million light years away, far removed from the willowy tail of Comet McNaught. We Earthlings are having the true close encounter. Comet McNaught (C/2009 R1) is gliding through the inner solar system, due to approach our planet only 100 million miles away on June 15th and 16th. The approaching comet looks great in small telescopes, and may yet become a naked-eye object before the end of the month. Because this is Comet McNaught's first visit, predictions of future brightness are necessarily uncertain; amateur astronomers should be alert for the unexpected. Get the full story and a finder chart from Sky & Telescope. See also: ephemeris, 3D orbit. 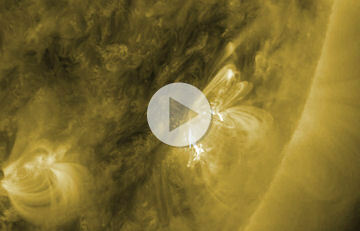 Eventually, this growing sunspot could unleash a truly significant flare. Our planet, however, is not in the line of fire. Sunspot 1078 is turning away from Earth and will soon disappear over the sun's western limb. Readers with solar telescopes are encouraged to catch it before it goes. On June 11, 2010 there were 1133 potentially hazardous asteroids.